Celebrate your engagement in style with a visit to one of our selected bars for engagement parties in London. We've selected some sophisticated venues providing the ambience you desire to make it a memorable occasion. Make it a night to remember with our guide to bars for engagement parties in London. 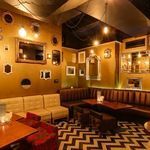 Undoubtedly one of the best bars in London to host an engagement party, Patch’s layout - along with its contemporary design - allows guests to have their own semi private area and benefit from the great party atmosphere with excellent DJ’s. Apples and Pears is a cool bar at the Aldgate-end of Brick Lane. They serve a variety of drinks including contemporary and innovative cocktails. Expect varied musical styles, credible underground sounds and no restrictions on genres. The Crooked Well bar and restaurant offers fine dining within contemporary surroundings. With two beautifully decorated private rooms on the first floor available for group bookings, The Crooked Well is perfect for all occasions. From private dinners to engagement parties and everything in between. Dirty Martini is a glamorous bar and cocktail house with an effortlessly cool interior. Dirty Martini on Hanover Square brings incredible cocktails and a friendly atmosphere to Mayfair. Dirty Martini is a glamorous cocktail bar with an effortlessly cool interior. Dirty Martini on Wood Street brings incredible cocktails and a friendly atmosphere to St Paul's. The Exhibit is an all day drinking and dining destination that has a revolving programme of events. The venue boasts a boutique cinema showing both the latest films and classics. There is a varied food menu and an impressive cocktail list which can be enjoyed in the garden during clement weather. Hack and Hop is a stylish, locals pub that has a good selection of craft beers and fine wines. There is also a varied seasonal food menu at Hack and Hop with dishes such as chicken liver parfait; Carlingford oysters; and steak tartare with goose fat chips. The Long Bar has an 80-ft long onyx internally lit bar surrounded with custom made silver bar stools, with a terrace courtyard off the bar. The Long Bar, to complement its decor offers fantastic cocktails including a wide selection of Martinis, and great food. The Old Red Cow is a traditional style London pub that serves a good range of beers, including real ales, wines and spirits. Children are welcome when dining. SAMA Bankside is an all day casual dining restaurant, cocktail bar, events space and arts venue located in Southwark. SAMA host renowned DJs every Friday and Saturday night. The riverside setting of this Teddington bar and restaurant would make a great setting for an engagement celebration. Situated in the centre of London, the famous White Swan Pub and Dining Room constitutes of a restaurant above an authentic pub area. The dining room is stylish and offers seasonal British fare whilst the bar evokes memories of the traditional British pub.